A day after www.islandstats.com brought you the results of Elan Daley competing at the Age Group International Short Course Championships. Today we bring you the performance of Elijah Daley who competed in the Men’s 11 - 12 years Age Group. 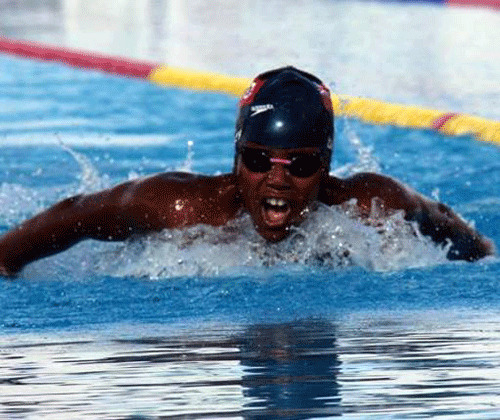 Daley reached seven Finals finishing on the podium six times, he would also lower four Bermuda Records along the way. Daley would pick up a Silver Medal competing in the 50m Butterfly touching the wall in the second fastest time of 29:13, breaking Sam Williamson’s time of 29.32 set back on March 4th 2017, Daley would capture a second Silver Medal when he touched the wall in a time of 1:05.87 competing in the 100m Butterfly, breaking his brothers record time of 1:08.42 set back on May 18th, 2014. Daley won a Bronze Medal competing in the 100m Freestyle with a time of 59.92, Daley would win a second Bronze Medal during the 200m Freestyle after he clocked a time of 2:11.84. During the 200m Butterfly Daley would win a Bronze Medal clocking a time of 2:28.58. Daley would break his brother record time set back on May 17th, 2014, when he was clocked at 2:38.44. Daley’s final Bronze Medal came during the 400m Individual Medley after he was clocked at 5:12.07, this time lowered the previous record time of 5:26.43 held by his brother Ethan Daley who clocked a time of 5:26.43 set back on May 17th, 2014. In the seventh Final Daley would finish 4th with a time of 2:31.05 during the 200m Individual Medley.